Karina's Kreations: Stampin'Up Big Day Sale-a-bration Card! Stampin'Up Big Day Sale-a-bration Card! Yesterday was our Creative Day Escape. I hosted the event with my two friends Donna and Brenda. We had 4 make and takes, 4 product demonstrations, swaps, and optional classes in the morning. 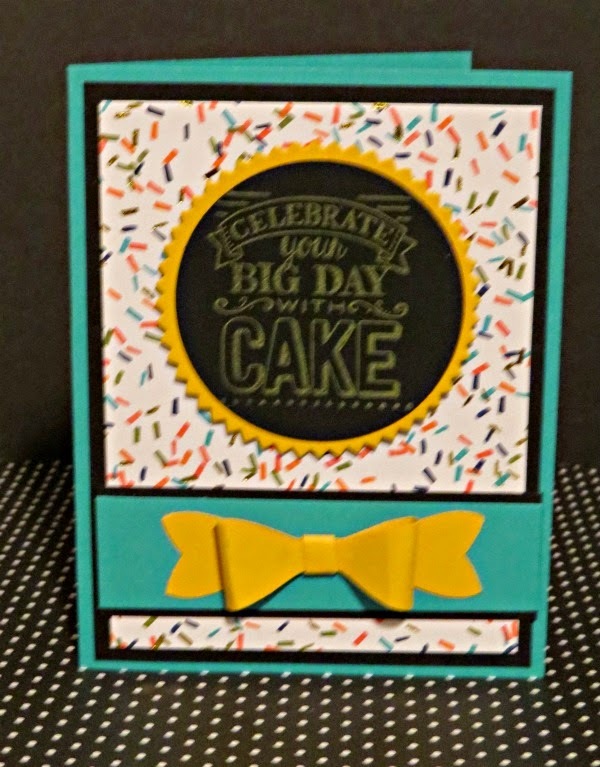 This was my make and take using the new chalkboard paper, yellow Citrus Chalk ink, bow builder punch and the Big Day Sale-a-bration stamp set. I forgot to the mention the Birthday Bash Designer Series Paper. If you haven't bought this paper yet, put it on your wish list. It's gorgeous!!!! The next event is June 13. Email me at kchin2@telus.net if you want to come.